Our products range from storm doors, patio doors, front doors, replacement or new windows for your living space, all types of decking ranging from PVC & Vinyl to Exotic woods. We have more sizes, grades & species of lumber than you will find anywhere else! We have all of the materials needed to make your dream outdoor living space a reality. How about an outdoor fireplace, or new siding? Give us a call today! Hackmann Lumber and Home Centers have a heritage that extends back nearly two centuries! 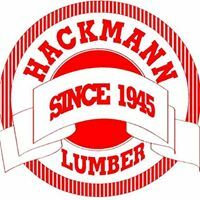 The original Hackmann Lumber store dates back to 1815, but its current family ownership took over in 1945 when John Wetter and a partner purchased the St. Charles business. From 1971 to 2000, the Wetter family added more locations in St. Charles, O’Fallon and Troy, MO. We can help with all of your home projects ranging from millwork, real wood decking, Vinyl & PVC decking, fireplaces, furniture & much more! At Hackmann Lumber, we work with St. Louis area developers & contractos by offering delivery services. In the last few years, the Wetter family implemented key relocations that will ultimately benefit their positioning in the market. In 2002, the St. Charles Capitol Drive location was closed due to traffic restrictions, and the Wetters upgraded both St. Charles Highway 94 and Troy locations. Hackmann Lumber and Home Center provides personalized experienced service for builders, contractors and “do-it-yourself” homeowners in St. Charles and Lincoln counties that are tired of the big box store experience. So, the Smartest Way to do your Homework, in St. Charles, Lincoln and Warren Counties, is Hackmann Lumber!